Aish HaTorah's Jewlarious web site pointed us to a funny but poignant episode of All in the Family where patriarch Archie Bunker goes to the funeral of Stretch Cunningham, his friend of 12 years, and finds out that Stretch had changed his name and was really Jewish and the beloved son of Chaim Cohnheimer. "I wouldn't have believed that Stretch was a Jew because he wasn't a doctor or a lawyer or in the dress business. He was just like myself -- an ordinary working hard working stiff. The video clip posted by Aish was edited to keep it down to four minutes. One result was the cutting of some of the funnier lines in the eulogy including a rabbi and priest joke that Stretch told. If you want to see the complete clip lasting 10 minutes you can find it here. Despite his usual gaffes and insensitive comments, Archie recovers and shows his best side. I watched this as well as the total, ten-minute eulogy. I found it very touching, and I found the interspersion of the canned laughter very offensive. 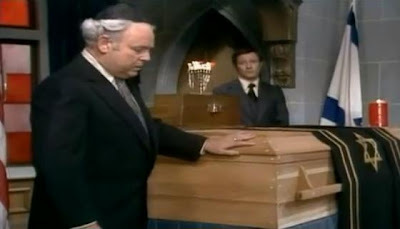 A mild chuckle at the funny lines would be understandable, but nobody guffaws at a real funeral. The show was filmed in front of a live audience. Did anyone else notice the crosses on the stained glass windows? Oops! So much for the Jews running Hollywood!